The defending Super Bowl champion Green Bay Packers are still on cloud nine after winning a title last February, but now it is time to get back to business as they will open their preseason against the Cleveland Browns on Saturday night. ears made move to improve their rosters moving forward, the Green Bay Packers were content and are more than ready to defend their Super Bowl title this season. It is uncertain at this point in time just how long the Packers’ starters will be playing against the Browns in Cleveland this Saturday, but there will definitely be some faces on the field in green and yellow that haven’t been on the gridiron in quite some time. 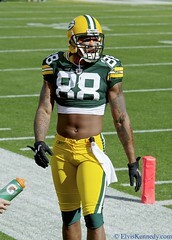 The two players that should impact the Packers more than any others that didn’t get much time on the field last season due to injury are running back Ryan Grant and tight end Jermichael Finley. It is pretty remarkable that the Green Bay Packers were able to defy the odds and win a Super Bowl title last season without Pro Bowl caliber players like Jermichael Finley and Ryan Grant, but coming into this season the Cheese Heads are a scary sight with these two offensive beasts coming back healthy and ready to go. The one player that will benefit most from the return of the starting running back and tight end is reigning Super Bowl MVP quarterback Aaron Rodgers. will take the pressure off Rodgers in the passing game as well with arguably his best redzone target back in the mix in Finley. Whether or not Grant and Finley are a 100% healthy and still the Pro Bowl caliber players they were before they went down last season remains to be seen, but the Packers will be happy to get them back in order to defend the Super Bowl title. As for the Cleveland Browns, the playoffs might still be way down the road, but they will look to develop quarterback Colt McCoy and get another Pro Bowl season out of running back Peyton Hillis. The offense will almost certainly be dominated by the running game with Hillis get a lot of carries this season, but McCoy might be able to surprise some people if he can strike up some chemistry with his receivers. So keep your eye on Ryan Grant and Jermichael Finley from Green Bay and Colt McCoy and Peyton Hillis of the Browns in this preseason game. All these players will be looking to make an impression.